Bought this after being impressed with the performance t-shirts - not as impressed with this one. The size seems to be a bit smaller and there is a different cut at the bottom which I never realised - like a bib shape so goes higher at hips. Unfortunately was at the gym when I tried it on so had no choice but to wear it - might end up in the depths of my drawers are the performance ones seem more suitable. 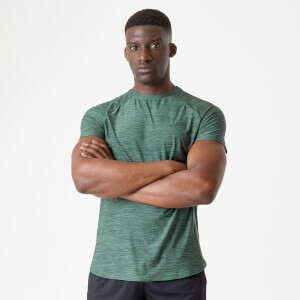 This is by far the nicest t-shirt I have got for fitness. It is so comfortable and light, great for exercise! 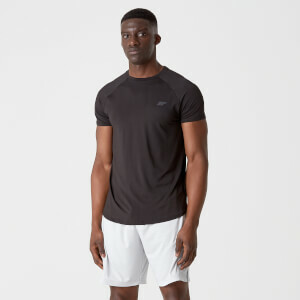 Regarding the picture of the model, the site claims that the model is wearing a size Medium and he's 6"2? I am 6 inches shorter, and I needed a size Medium (the small was too short on me). I weigh 74kg and I am slim. I hope this helps people when choosing a size as I usually buy size Small for MyProtein clothing, but these t-shirts needed a size bigger. Great fit, looks great and washes well. Recommended!